Within 50 kilometres from Odisha’s capital, Bhubaneswar, there is the picturesque village of Raghurajpur. 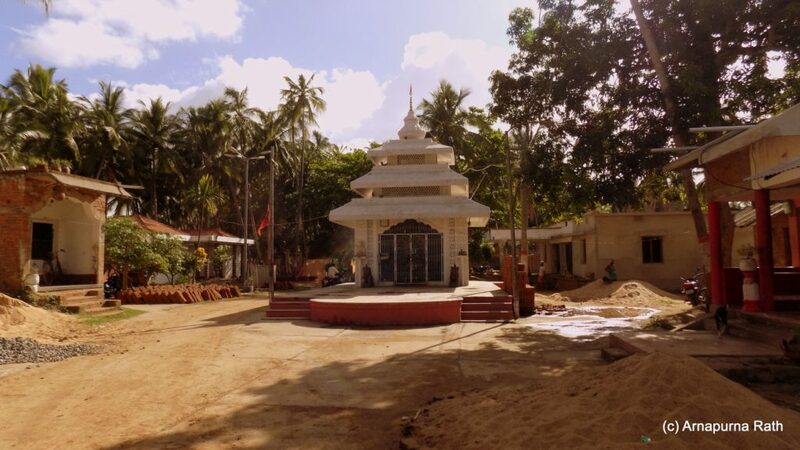 The village is just ten kilometres prior to the temple town of Puri, and within a kilometre from NH-316. It is surrounded by tall coconut trees and richly textured paddy fields. Art is an integral part of the lives of the Pattuas. Episodes from Mahabharata and Ramayan painted on the walls with organic colours. Odisha welcomes the first monsoon showers. 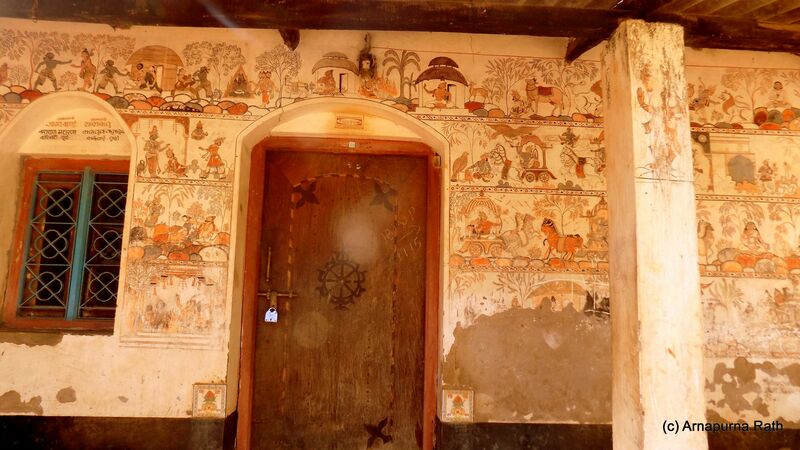 Situated on the banks of river Bhargavi, Raghurajpur is a village of artisans who practise an exquisite art form called Pattachitra that dates back to the 5th century BC (going by the available records and historic evidences). Raghurajpur is representative of the rich culture of Odisha. There are around hundred eighty households in the village. Most residents are artisans practising stone art, and other handicrafts or are the Chitrakaras, that is, the painters of the Pattachitras. These Pattachitras mark the union of literature and art, spiritual and profane, the human and the divine. Every modest household provides space to this art form. The entire art form flourishes in this tiny compact village. It is fascinating to observe how every living room is basically an art studio, while every backyard is a workshop of the artists. If you stop by these households, anytime during the day, you will most likely see the artists deeply engrossed in making a Pattachitra. However, they will take time off to explain the intricacies of the art form. The Visurupa-Darshan or the Universal form darshan, an episode from the 11th chapter of Srimad Bhagavad Gita is recreated in this wall Pattachitra. 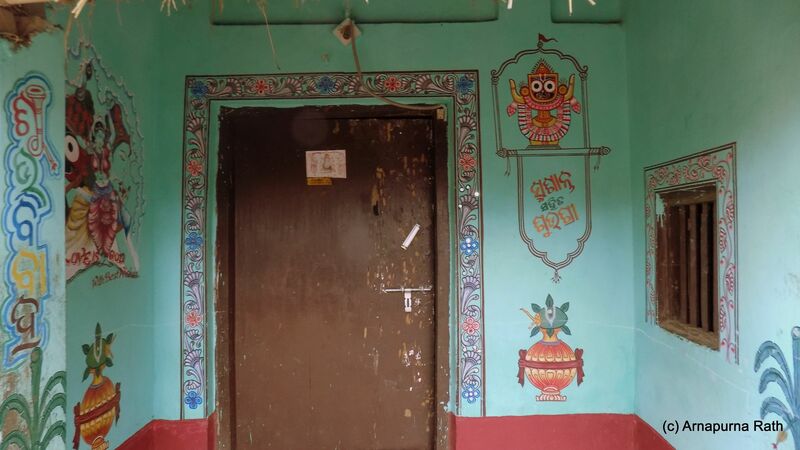 The Odia script on the walls of this hamlet read "Shubha-Vivah" (Happy-Wedding) and an Odissi dancer superimposed on Sri Jagannath's form speaks of the union of the god with the human. "Love is God" is etched below the form of Jagannath. The name of the bride and groom are also mentioned on the right side of the wall above the Kalasa. This kind of written scripts and wall art is a common traditional practice where the outer walls of homes are painted before weddings to mark an auspicious beginning. The form of Pattachitra is witness to the archetypal rituals and beliefs of the Jagannath culture of Odisha. It organically links art and spiritualism to the lives of the common people. The origin of Pattachitras has connection to a particular annual temporal phase of the Jagannath temple tradition. The triumvirate deities of the Jagannath temple at Puri – Sri Jagannath, Sri Balabhadra and Devi Subhadra have a ritualistic bath on the Debasnana Purnima day that comes (according to the Panjikaor almanac of Jagannath temple) during the full moon of the Jyestha or the summer month in Odisha. The “gaan-danda” or the village mainlane with the small “gaan thakura” or the village god guarding the outskirts of Raghurajpur. After the bath, the deities traditionally and ritualistically are afflicted by a high fever that is known as Anasara in Odia language. The Anasara is practically a time-lag required to prepare the deities for the grand car festival or the Ratha-Jatra that occurs around a month later. During the Anasara, devotees do not get to see the gods inside the Garbhagriha of the Jagannath temple (known as Ratnamandapa). Instead, they are allowed to worship the gods in the form of these Pattachitras. Inside the Jagannath temple they are popularly known as Patti-diyans or Anasara-Patti. They are exquisitely designed for the temple by expert artisans. 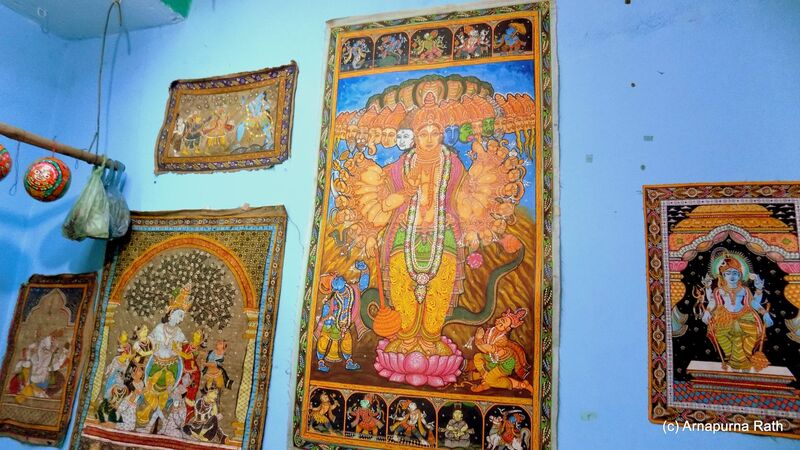 The word Patta refers to cloth and Chitra refers to painting; literally meaning cloth-painting. The Pattachitras were originally designed as substitutes who are worshipped as “Patti-diyans” (the cloth/paper gods) when the original deities of the Puri temple suffer from fever (colloquially known as ‘anasara’) during which the temple doors are closed for public darshan. The themes of these paintings are mostly drawn from the oral narratives surrounding the dense and mysterious Jagannath culture and Vaishnavite traditions. Stories like Kanchi-bijaya, Dasavatara, Niladri-bijaya, and Krishna-leela including Rasa are the favourite themes of these Pattachitras. Many of these stories come from the Puranic tales, especially Skanda-Purana. The Odia poet Jayadeva’s magnum opus Geeta-Gobinda often provides a lyrical background to these intricate art forms. There are some Shaivaite themes as well. 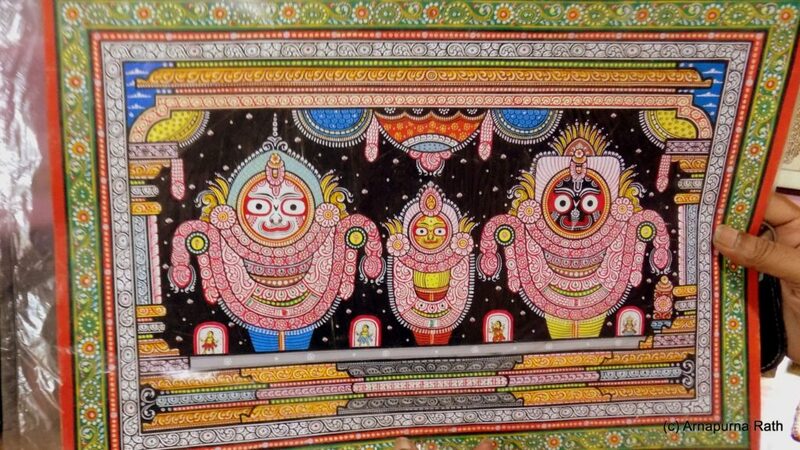 However, most of the Pattachitras available for public viewing are based on the Jagannath deity as the predominant motif. 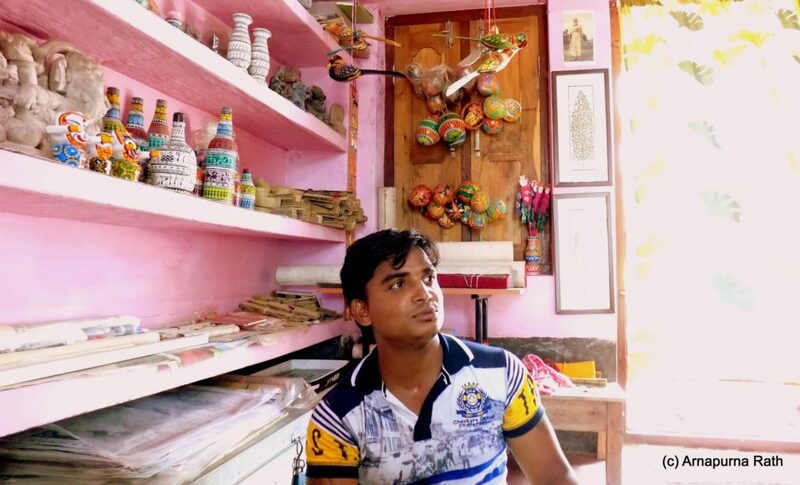 Raghurajpur’s artisan community, also called the Pattuas has nurtured the art of Pattachitra for generations. It is a labour-intensive art form. 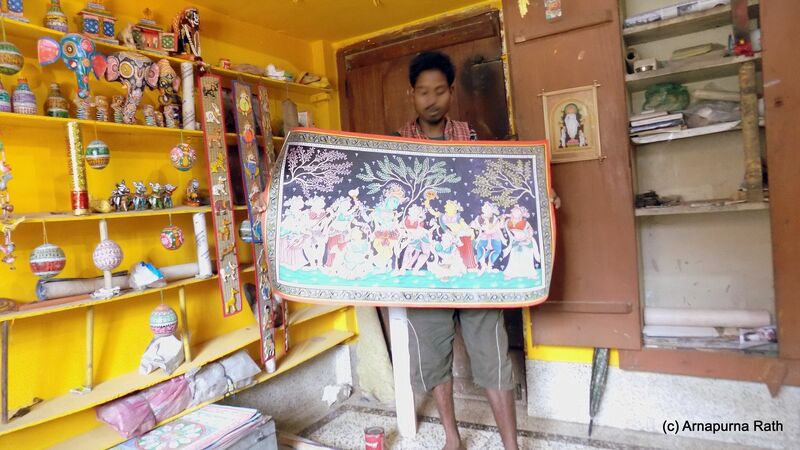 Pattachitra is a part of a sacred heritage for these families which they cherish and practice through generations. A Young Pattua at his family studio. 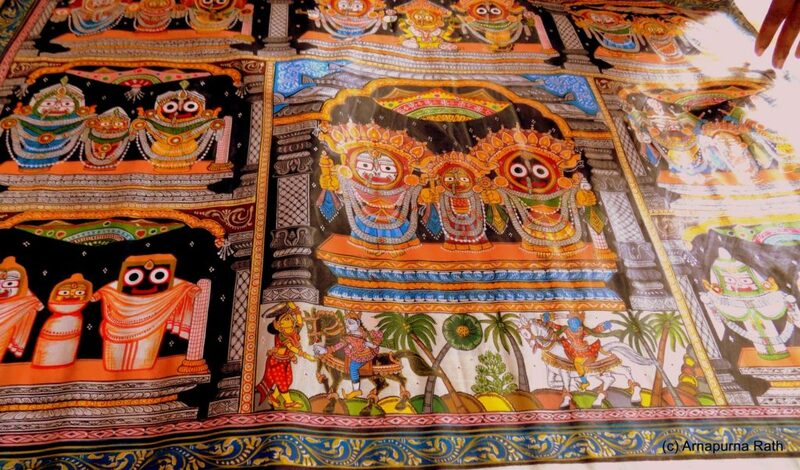 The Pattachitras are painted on paper or tussar silk or on Khandua silk. In addition to Pattachitras these Pattuas also make stone crafts, masks of plaster of paris, coconut shell painting, and other art creations. As in many art-centred villages, this one too maintains a subtle gender hierarchy with the art form practiced mainly by the men, while women actively help them in the creation of materials like colour, canvas, etc. which are purely organic. In fact, the manual part of the labour is sometimes the responsibility of women of the household. I was informed that women of the household grind (traditionally on a stone slab) and prepare the colours from natural ingredients like tamarind seeds, conch shells, Haratala stone for the yellow colour, and Hingula, a traditional red stone colour. These colours are meant to get the exact hues for the Pattachitra. The men of the household carefully design the borders (called dhadi-bhida) and draw the sketches (tipana) of the particular story to be depicted on a rough cloth piece. These Pattas are prepared by processing old coarse cloth material and developed into canvases that last for generations. Each part of the work is a stage in itself with specific technical and artistic grammar designating that particular stage and demanding a certain degree of perfection and proficiency. For instance, the art begins with dhadi-bhida or border sketching, moving into the time when the senior artist or the guru rectifies the mistakes, if any, in the Patta (a stage called bageiba in Odia). 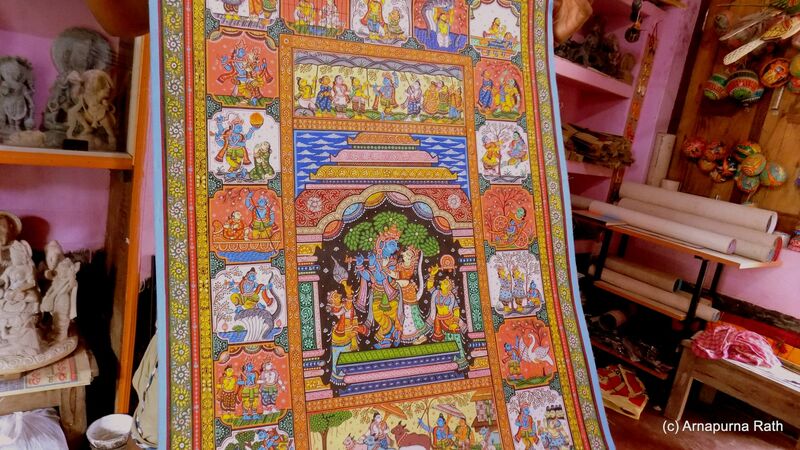 The intricate designs on the Pattachitras are no less than a sacred ritual for these Chitrakaras. Experienced painters and senior members of the family draw the fine lines on the paintings (called Sarukala in their parlance). Many Chitrakaras will narrate the story of each of their art pieces, while displaying them to their visitors. They can be sometimes overenthusiastic and persuasive with visitors, considering the fact that not many common people visit Raghurajpur. It is only the art connoisseurs of western tourists who visit the village. Many in Odisha are not aware the rich cultural lineage of this village. These days the artists make it a point to give credit to the women who have either helped or actively designed these Pattachitras; saying “this one has been designed by my mother, or my wife, or my sister”, keeping in mind the changing tastes of the western and Indian visitors. There are multiple forms of these Pattachitras that are designed and presented in different mediums; the ones designed on Talapatra or palm-leaf are called Tala-Pattachitra; there are some pieces that are designed on Tussar silk, those designed on the coconut shells and some cheaper ones on paper and sold for common household worship are called Jatri-pattis. Helle Bundgaard in her book Indian Art Worlds in Contention: Local, Regional and National Discourses on Orissan Patta Paintings (1999) points out that these Jatri-pattis are exclusively made by women artists. I was told by one of the artists displaying Pattachitras at his residence that these days Jatri-pattis are rare and a dying art. The prices of the Pattachitras vary according to the labour that has gone into them and also by the size of the Pattas. However, they can be as expensive as 50,000 rupees and as cheap as a few hundred rupees. The village, richly endowed with culture and art, is also the birthplace of the doyen of Odissi classical dance form, Padmashri Kelucharan Mohapatra. There are certain households in the village that specialise in the Gotipua dance form, one of the famous sub-genres of the Odissi form (specifically performed by the male dancers). The village continues with the traditions of Guru-Shishya learning systems and if people are interested in learning either the dance form or the art form, they have to live in the village, stay under the tutelage of a Guru, and adapt to the community lifestyle and challenges of living. For a visit to Raghurajpur, November-December will be an ideal time of the year. Note: During my recent visit to Raghurajpur in February 2017, I observed a large scale renovation going around in the village. I was informed that the government was taking keen interest in supporting the artists and helping them with an overhaul of their village into a “model artists’ village.” All photographs in the article were clicked by the author in December 2015. Lovely Article. Loved to read the details with which the art is understood and explained. The photographs add more dimension to the article. Good work Annapurna!! Lovely article Arnapurna. Had me riveted. Am not the arty farty type, yet I could not put this down. Viva la Odisha. @Bakul Desai: Thank you for the kind words of appreciation. You have to come to Odisha and you will become the ‘arty-farty’ types 🙂 . Odias (at the risk of generalizing) are too humble to accept or acknowledge (and sometimes understand) the rich heritage that they possess, and there is a pervasive apathy in the present generation towards traditional art forms. 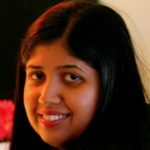 @Kundan: Thank you for reading the article and for appreciating the photographs. They were clicked by a simple point and click digi-cam. Thanks once again for appreciating. Hi Arnapurna, Even though I’ve lived in BBSR for two years and I’ve liked pattachitra ( specially the trees and animals ones on the plain olive green background ones) for years, I never realised that most of the art comes from one small village alone ! Eye-opening. Loved the snaps too. @Zen: Thank you for the thoughtful comment 🙂 Let me know what aspect of Odisha you would like to read about. I will try to figure out if I can research and write something about it. Thanks for appreciating :). Very nice and informative article on this totally unknown art form from Odisha. A visit to this village is not even suggested in various tourist guides. If only I had known about this beautiful place, we would have included it while visiting Bhubaneswar, Puri and Chilika Lake area a few years back. Even the hotel desk people in Puri didn’t suggest visiting Raghurajpur. Of course, there is always the next time if it ever comes! Your photographs of the Pattachitras bring out the beauty of this art form without which it would have been impossible to appreciate it fully. Thank you for an informative article!